DAWSON CITY, YUKON TERRITORY — Parade’s about to begin. From my vantage point perched on the edge of the boardwalk I can see the start down at the end of Front Street. The sun’s broken out, spotlighting the slopes of the Midnight Dome. At the turn of the last century 10,000 people populated this mountain rising up over Dawson City. Today it’s home to 10,000 – or more – white spruce. Midnight Dome forms the background for a quintessentially Canadian landscape. Flora Dora Hotel is middle ground: tin roof and false storefront, circa 1896. Front Street is foreground. Behind me, on the shores of the Yukon River, a beached sternwheeler paddleboat reclines – S.S. Keno. Roughly 120 years ago the boat carried prospectors to this very spot. Today’s celebration, tied to a statutory Yukon holiday called Discovery Day, is testament to that halcyon era. I hear the band. Well, the pipes and drums. Well, the pipe and the drum, anyway. Right behind them Canada’s provincial flags swirl, carried down a street almost unchanged since the Klondike Gold Rush (pretty well the whole town is a Parks Canada National Historic Site) by members of the Yukon Order of Pioneers. Their place of honour is well-deserved. Based on their lobbying efforts, Discovery Day was born in 1911. It’s still observed on the third Monday in August, recognizing the discovery of gold on August 17, 1896. Dawson City is ground zero: the prospectors who made the find hit the jackpot just outside town at a location that has been renamed Bonanza Creek. But like everything else here in Dawson City, Discovery Day is bigger than life. A single day turned out to just not big enough or long enough to mark what the gold strike meant to Yukon’s outpost just south of the Arctic Circle. So, the Discovery Days Festival was launched and this year it runs from August 16-20 with a whole slate of celebrations, attractions and activities. 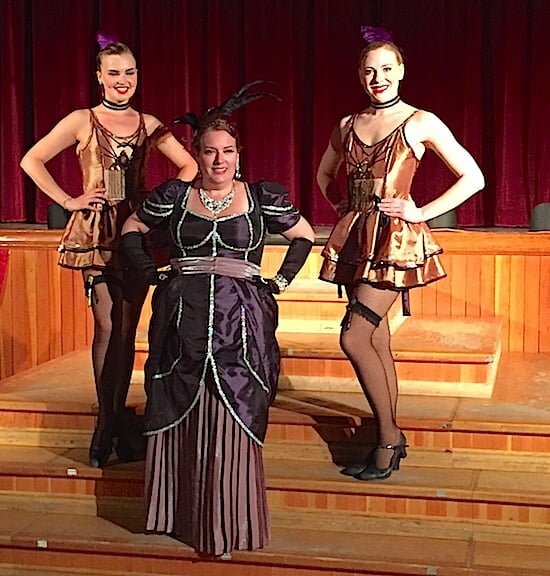 The festival is a key reason Dawson City was selected as the No. 2 destination to see in the Vacay.ca 20 Best Places to Visit in Canada in 2018. Now it’s the kids, riding bikes beneath clouds of balloons. Just behind them are the can-can dancers from Diamond Tooth Gertie’s. Couple of minutes later, on a flatbed float, is a reenactment of a period saloon scene – replete with more can-can girls. Three shows tonight, over at Diamond Tooth Gertie’s Saloon. First two shows are fun and touristy. The last one is R-rated. Double entendres from the sultry chanteuse, dancing acts a tad less tame than earlier in the evening. And in between blackjack and slot machines. Over to Downtown Hotel’s Saloon. The old days you were talking “sourdough”, which became a nickname for prospectors — kept the dough close to their chests so it wouldn’t freeze. Seems it might be one of the few foods they could always count on. Different spelling tonight. Think a lady in a captain’s hat, a table, a silver tray, a mound of white salt and a black human toe. Sourtoe, get it? Visitors are already lined up, waiting to join a grisly fraternity, entertained by a local pounding honky-tonk and hurdy-gurdy on an out-of-tune piano. Have to down a shot of whiskey with the toe floating in the glass. Toe has to touch your lips to count. One Sourtoe Cocktail, please. Now a guy rides by on a unicycle, dressed in shimmering gold on a glittering conveyance — both rider and vehicle tribute to the Gold Rush. And then you hear it, growling like tigers, roaring like lions, a concatenation of heavy-duty trucks sporting gigantic tires. Later today: the Mud Bog. Head up to North End Park, find your own spot on the hill, part of a cheering throng. Listen to the roar of these trucks competing in match racing through twin pools of water and mud, engines roaring, tires spinning dizzyingly, black and brown explosions like artillery blasts, all while you scarf down a hot dog or two. Or maybe get some culture: Riverside Park hosts, in a collection of tents and vendors booths, an art show and farmers’ market. Maybe catch some live music after the parade. Maybe catch a ball game: big fastball tourney goes on at the other end of town during the festivities – big draw for locals from across the region. Then go for a cool one or two after the last pitch. 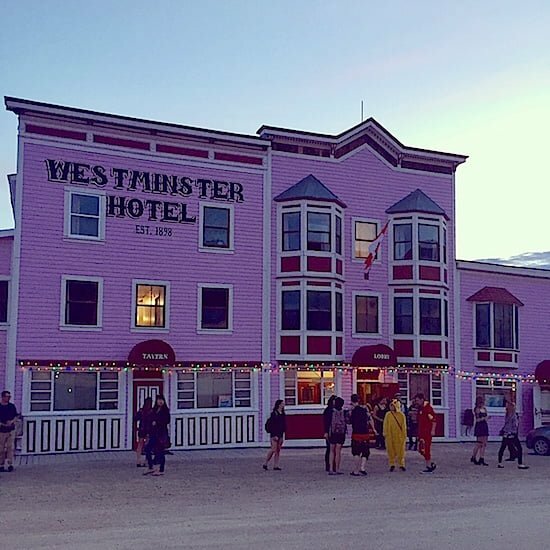 Pink-fronted Westminster Hotel – circa 1898 – is home to two wild and crazy bars. One’s known as the “Armpit”, the other’s called the “Snakepit.” One opens around 9 a.m. One closes at, well, sometime. Maybe take a hands-on history lesson. Head out of town to Claim #33 and learn to pan for gold. Meet a man in a black derby who takes you on a walking tour of the town, featuring historic sites like the Bank of British North America and a recreated saloon. Visit Jack London’s homestead, meet the spirit of Robert Service. 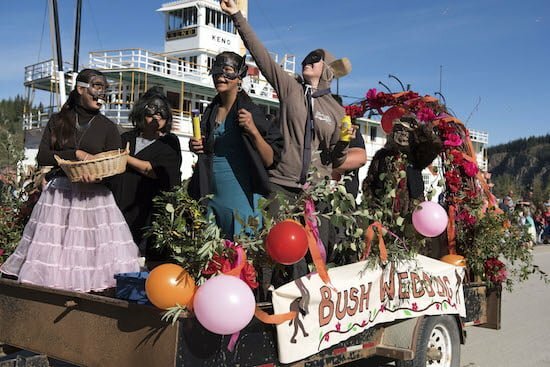 Now, coming down the street, is a celebration of a “bush wedding” on a First Nation float. Seems appropriate that Dänojà Zho Cultural Centre is right behind you. Housed in a modern but tradition-inspired building, this riverside repository offers both history and culture, for you’re in Tr’ondëk Hwëch’in territory. (The name “Klondike” is a corruption of that tribal name). Black derby guide; First Nations art and tradition; a rollicking, raucous celebration. And now, sometime between the fire-engine-red fire engine with even more can-can dancers draped lasciviously across its fenders and the end of the procession, it hits you. 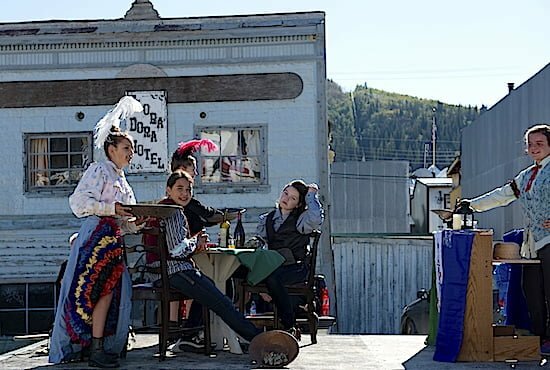 You’ve discovered, during Dawson City Discovery Days, a must-do Canadian landmark, a place where history and culture, like this summer parade, fill the very streets. And now, on a sunny August morning, you make just more discovery (as if you didn’t know it already).